I don't know about you, but I love holidays because that means the whole family will be getting together for dinner. I'm especially excited about Easter dinner this year since my awesome mother-in-law is hosting at her house again. As some of you know, I've been super busy with family stuff this past month, so I am really looking forward to just enjoying the day, minus all of the work that goes into prepping for a big family meal. Of course, I won't show up empty handed, but I haven't decided if I want to bring a dessert or a side dish to dinner this year. 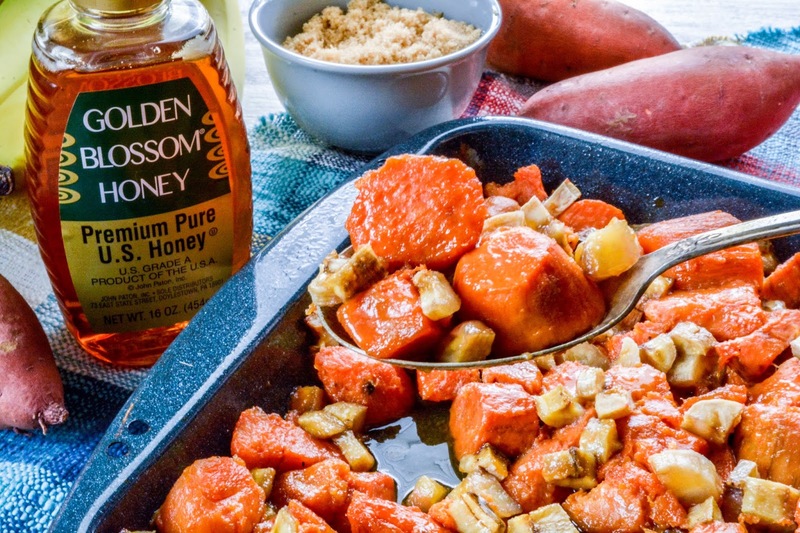 I did browse Golden Blossom Honey's Easter section on their recipe page, and thought I'd try my hand at a yam recipe. Yams are something that my mom has every Christmas and Easter, but it's something I've always refused to scoop out onto my plate. However, I've been feeling a bit adventurous with my meals lately, so I thought I'd give this Yam & Banana Broil recipe a go. I'll admit, the combination isn't one that I normally would have tried, but since I'm always telling my girls, "How do you know you won't like it if you don't try it?" I decided to eat my own words and pulled out my broiler pan. The end result was way better than I had anticipated. I was worried that the bananas were going to turn to mush, but they ended up baking to almost a fruit snack consistency. What surprised me most though, was banana actually pairs excellently with yams! The end result was almost dessert like. Sweet and tender and full of flavor. 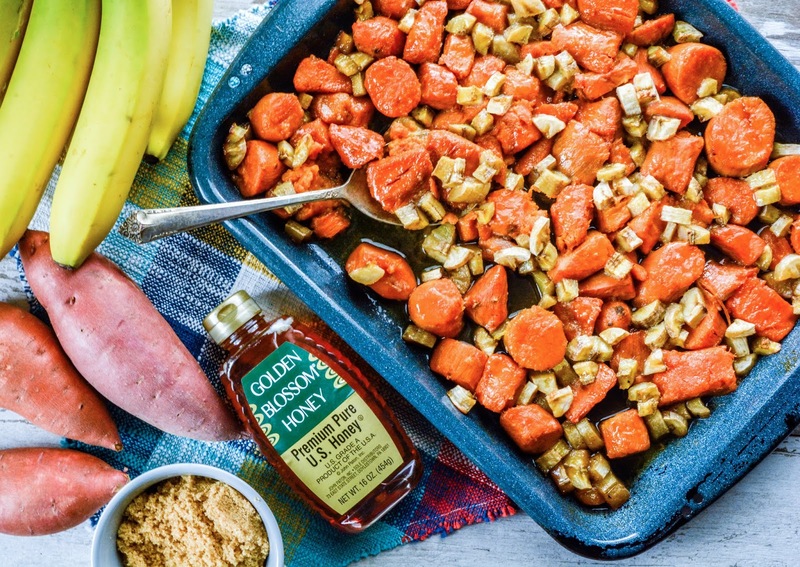 Prep time with this recipe is minimal, and broil time is only 8 minutes, so if you're looking for a simple side dish to add to your Easter fixin's, don't count this one out. I think it may surprise you too! What's an ingredient combination that you've tried that turned out surprisingly delicious? I think I'd skip this one if you bring it to Easter dindins :PPP But I do love the pan! Hope you will have a swell Easter at the in-laws! I hardly ever use that pan. It came with our stove over 15 years ago and I've only pulled it out a handful of times. I am so looking forward to a meal that I didn't have to cook. Bring on Easter! I didn't think I would, but I ate more than my fair share of it! It doesn't surprise me that it works. My Step Grandma was from the Philippines. She used to make banana egg rolls. I don't think Mica would like it though. He's not a big banana eater. We do have them in smoothies though. He doesn't know he's having banana. I've never had a banana egg roll, but that does sound delicious! You could pop some chocolate in it too for more of a dessert option. I love that you're such a sneaky mom, putting bananas in his smoothie. I eat one every day in my oatmeal, but like them in my smoothies too. That looks delicious! Both yams and banana are so good when they're cooked up. They get so much sweeter. Hi, Teresa! Your recipe looks delicious! And the yams look more appealing than when covered in marshmallows. Enjoy your day off from cooking and have fun with your family! I haven't tried them together, but I do bet since they are two of my granddaughter's favorite things, that this would be a HUGE hit with her! What an interesting idea. I usually put brown sugar on my yams. I've never done this before but this looks really good. Love seeing new food ideas. Yam and banana broil looks so delicious! I can't wait to try cooking it at home. So yummy! I love yams a lot. I never thought to mix bananas and yams together. I think this is an awesome dish alternative to your traditional sides one would have for Easter dinner. I would like to try this!